A moving speech on climate change. I just felt that this has to be shared. Philippines delegate Naderev (Yeb) Saño, announces his decision to go on hunger strike on the first day of the COP19 Climate Change Summit in Poland, 11 November 2013. Making an impassioned plea for action by the conference, he said that he would be fasting in solidarity with his country-folk until action to prevent climate change is forthcoming. Saño received a standing ovation after describing the hardship suffered by Filipino’s, including members of his own family, due to the “colossal” typhoon Haiyan which recently hit his country. Before I start, allow me to apologize that I am sharing a picture that is not mine. And so I decided not to write “Weekly Photo Challenge” before my post’s title. This is not part of the challenge, but I’d like to share this with everyone. For the last few days, it was very difficult for me to watch the Filipino news on tv. 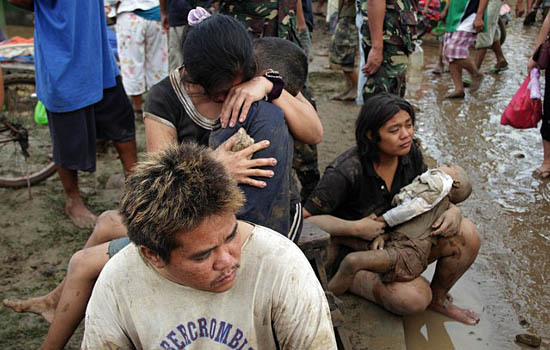 Typhoon Sendong came like a thief in the night, killing more than a thousand of my fellow Filipinos while they were sleeping, early morning of December 17. The floods went up very fast and mud went inside almost every houses in Cagayan de Oro City, Iligan City and other nearby provinces. 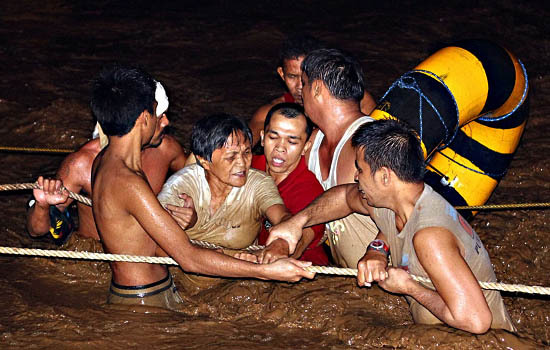 People were caught by surprise, as their towns do not usually flood easily. To date, the number of deaths have reached more than a thousand, some more thousands injured, lost their loved ones, lost their homes and properties – lost almost everything. Each time I watch the evening news, my heart sinks as I watch and hear the stories – a father who lost his wife and all his children, a boy who has no where to go because all of his family members have died, and his house have been swept by the flood, a mother carrying her dead son full of mud. I saw people asking for help in the evacuation centers. There was not enough food, water and clothes – basic stuff that most of us enjoy and just take for granted. And tomorrow is Christmas. And as I sit here in the comfort of our room, I felt so blessed. There was a huge gap BETWEEN my life and some unfortunate others. And so I don’t have a single right to complain about my life. Grant eternal peace to those who lost their lives. Embrace the children who died in their innocence. Help those who are hurt and cure those who are sick. Encourage those who suffer the destruction of their homes and properties, and to once again stand up and rebuild their future. If you are interested to help, check out this link for various ways to help. Click HERE. 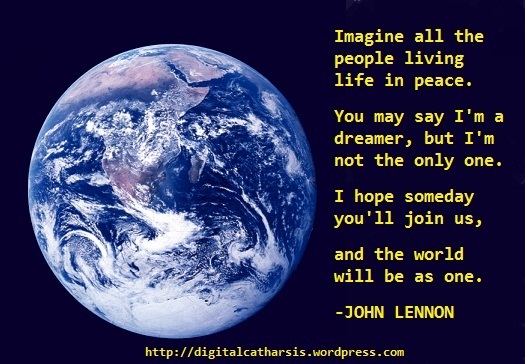 World peace is one my dreams. I always wish that someday, people will just set aside their differences and live in harmony forever. I know that it’s still possible. Today, thousands of blogs, FB and twitter accounts from across the world will be showing off their peace globes to show support to the global peace movement dubbed “Blogblast for Peace”. Blogs will flag the title “Dona Nobis Pacem”, meaning “Grant Us Peace”. Check out founder Mimi Lenox’ site for the details. This is my 2011 contribution and support. 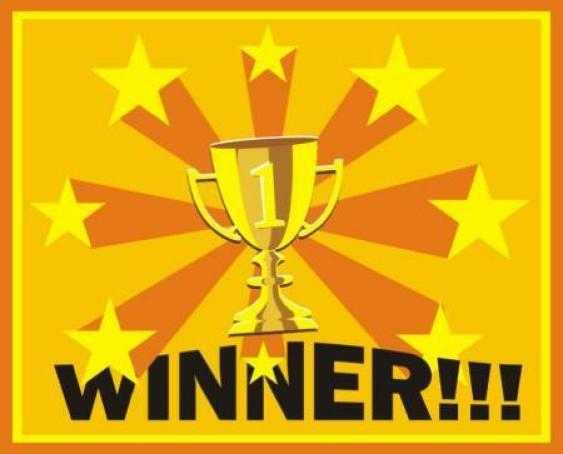 So today is the day I promised to announce who the winner will be for our “Birthday Giveaway.” Isn’t it exciting??? 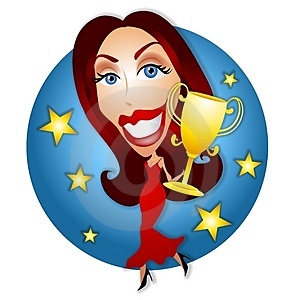 Well, before I reveal who the winner is, allow me to thank all those who participated, especially those who really put their time and effort in collecting the points in order to win. I know how difficult it is to get through the different pages. Sometimes, I would take note of the time the first comment was placed, and the last time that same person commented. I would notice that some really spent hours on this site jumping from one article to the next. Thank you so much and I appreciate everything. Anyhow, I hope that you enjoyed reading my posts, and commenting at the same time. I am sure you got to know me more through my writing, and I wish this has started friendship amongst us. Thank you all for your time and I hope you guys comeback to visit – with or without prize. It was really tough counting all the points and I have to get through all the sites submitted. I started counting when I was in Abu Dhabi some weeks back and finished here in the Philippines. It was a tedious process! Sorry that I have to disqualify some entries, like redundant reposts on the same blog site, redundant comments etc. I had to be fair with everybody, and to tell you frankly, I don’t know any of the participants personally. The blogger friends I know decided not to join. Congratulations, Kayce! You did a very good job! Actually I did not count some of your double comments, but you still ended up as the highest scorer. Well done. You will be contacted shortly for your hundred dollar bucks! Congratulations! You will also be receiving surprise gifts (but not hundred bucks anymore, ha!) and I will notify you shortly about it. My internet service was off for two days, then I got busy with night-shift work for another two days, so I was basically unable to check what was happening to the contest during these last few days. The last time I was online, I wasn’t sure about continuing this birthday pakulo because there wasn’t much activity going on. There were no participants during the first 2 days after it was launched. I was surprised when I got back online today. The comments were flooding 🙂 I basically spent hours reading comment posts and checking out links, but I really enjoyed it. I have started tallying points this evening and I didn’t realize that it is going to be a tedious process! Oooops they are not winners yet, okay? There are still 3 weeks before the contest ends so you still have a chance to catch up. Keep earning those points! Just to clear something about the rules… the “LIKE” button I am pertaining to is NOT the FB “like” button that you find near the “tweet” button. I am talking about the “LIKE” button with a “yellow star” sign on it. That is found at the end of the posts, just before reading the comments. And this applies to WORDPRESS USERS only, because you need to be logged in to WordPress before you can click it. If your account is not in WordPress, then forget about it. The clicks on the FB “like” button do not get points. Sorry for the confusion. 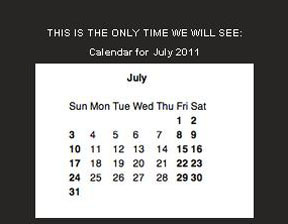 This year, July has 5 Fridays, 5 Saturdaysand 5 Sundays. This happens once every 823 years. This is called money bags. I was told to forward this post to my friends and money will arrive within 4 days. There’s no harm in trying, so I just did! one who does not forward…..will be without money. Sigh! This is the year of the Money!!! A powerful earthquake with a magnitude of 8.9 hit Japan just a couple of hours ago. 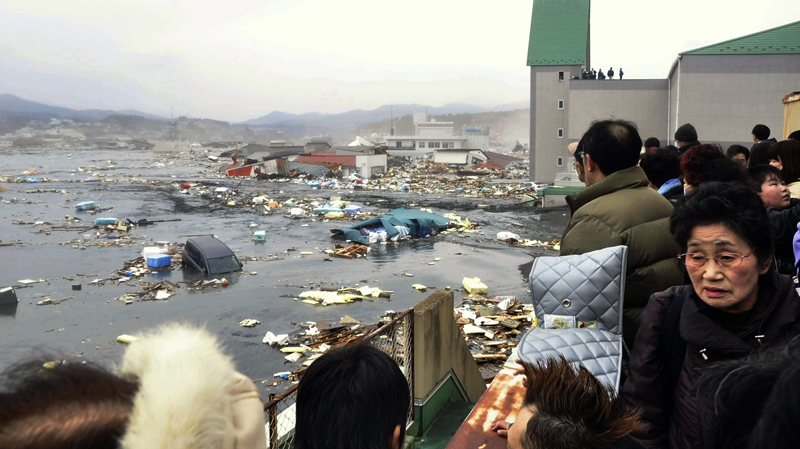 The quake unleashed a massive tsunami that hit Sendai City in Northeastern Miyagi. According to the news 40 are confirmed dead and thousands injured, but I guess this figure will still rise, as I look on tv at how this catastrophe destroyed this part of Japan. I just came back from a family trip to Dubai when this report surprised us on tv. My wife worked for a couple of years in Japan, and she has lots of friends there. And so it’s quite disturbing to think of how people are suffering there at this moment. Watching the live news from the Filipino Channel, I saw how dark-colored flood was spreading through the streets, swiping away cars, trucks and houses. That was a video footage by a helicopter, done by the local Japanese tv networks. Just recently, a strong earthquake also hit New Zealand, leaving many dead and many homeless. I come to think how easy it is for nature to destroy us, how easy life can be. Nobody knows our fate except the One above. He is the most powerful and only Him decides who goes and who stays. That decision is never in our hands. As I close this post, allow me to leave a short prayer for the people in Japan. O Lord, in this time of need, strengthen us. You are our strength and our shield, a very present help in trouble. I know Father, that Your eyes go to and fro throughout the earth to strengthen those whose hearts long for You. The body grows weary, but our hope is in You to renew our strength. We do not fear for You are with us. We are not dismayed or overwhelmed, for You are our God. We know You will stregnthen us and help us; that You will uphold us with Your righteous hand. Even as the shadows of disasters cover us, we feel the comfort of Your strength, O Lord. A tsunami warning was issued for all neighboring countries, including the Philippines. My prayers goes to everyone around that might be affected. I pray to God that this tsunamis subside and disappear in the waters, before it hit the grounds. Please join me in my prayers. I know God will listen. I was reading a lot of posts about yesterday’s Quirino Grandstand hostage crisis, and this one caught my attention – because this one’s from the pen of a person who was actually inside the bus. Allow me to repost this narration of the incident by Bang Lu Min. There are lessons to be learned. Mr. Mendoza was already upset even before he saw on television what the policemen did to his brother. 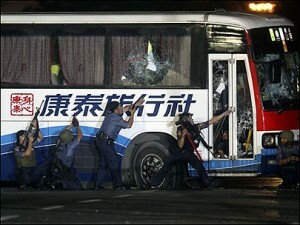 The other tourists who remained inside the bus were complaining. 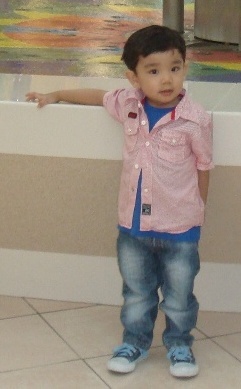 Wei Ji Jiang wanted to go to the bathroom. Dao Chi Yu was hungry and the rest were just groaning and whining like they have forgotten that our lives rest in Mr. Mendoza’s hands. The hostage taker, as you know him was really nice. He treated us okay and even let the elders and the children leave the bus. He said your policemen treated him unfairly. He was a policeman too and was accused of doing something he had no knowledge of. But your government didn’t listen so he used us to get everyone’s attention. Things would have never turned for the worst if he didn’t see how his family was dragged out of their house and taken into custody. He was watching the news all the time as we huddled around each other behind the bus. He shouted some words in your language then started shooting in the air. A girl about my age started screaming. Mr. Mendoza demanded her to stop but she didn’t understand English. God, he had to slash her neck with a knife just to put her to rest. Her boyfriend who tried to hit him was shot in the head. Tension was rising. You can see in his face how scared and confused he was. The bus driver ran away leaving him alone with strangers from a distant land. I can see him walking across the aisle, sometimes pointing his machine gun to one of the tourists. But he tried his best not to hurt us, especially those who really cooperate. I guess its in your nature not to inflict pain on others unless it was necessary. I remember him saying that he will free us before sundown and implored us to forget everything when we return home. But his words don’t matter now. The policemen were trying to force their way in, while we all lied down to shield ourselves from bullets. Mister Mendoza blindly shoots at his enemies which I think kept them from rescuing us. I hear sobs under the chairs. Some were even shouting the names of their loved ones even when the air merely eat their words. Kevin Tang tried to escape when the glass door was was shattered, but one shot and he slumped on the floor with blood gushing from his mouth. Taken from Uma Khouny’s FB. Picture from Seerpress.com. Update: I read from FB that according to sources, this letter was found to be a FICTION as there is nobody named Bang Lu Min among the survivors. As to whether somebody just made this up in not a good idea, as we should not be playing with the feelings of the victims. Or could the writer be a real survivor, but decided to change his name for the sake of confidentiality? We’ll soon find out. A Salute to the Teachers! The national elections in the Philippines is finally over. I believe that despite the isolated cases of election failure in certain places, the first-ever automation of elections in our country was a success. This will not be possible without the relentless efforts of our dear teachers who went out of their way as teachers to become Board of Election Inspectors. They truly are the heroes of the nation. 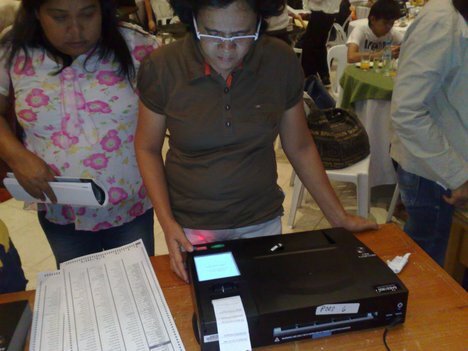 It was everybody’s first time to use the new automated system, particularly the use of this PCOS machines, but they tried their best to keep the elections in order. Congratulations and I salute you all. Cheers! One of the Filipino traits that I am proud of is resiliency – that after all the calamities and misfortunes that our country has been receiving, we bounce back and try to overcome all the challenges. This is what Kuya Efren showed to the world by being chosen the 2009 CNN Hero of the Year. The Filipinos may not be rich in material things, but they are rich in their hearts. Congratulations, Efren Penaflorinda. You make the Filipinos around the world proud.